This is more of an update than a real blog entry. 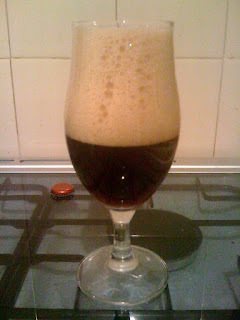 I brewed a Black IPA a while back and blogged about it here. For completeness, I thought I would update on progress. I've now tried both the S04 and the Belgian yeast versions of the beer. Both are still a long way off being ready. Both have huge, in-your-face, raw alcohol on the nose and on the palate. Behind that you get the hop and you get slight roastiness. I think both could mature into decent beers, but they'll need a while yet. They've had about two months in the bottle and they could probably do with at least that amount of time again. Other observations include a slight lack of hop aroma and flavour. In the case of the Belgian version, this could be down to the yeast dominating, but either way, I think the beers would benefit from some dry hopping. Overall, I'm happy with progress and with the beer I made. I've had Bashah a couple of times since the blog I wrote [about black IPA's]. I have to admit that I've sort of fallen out of love with it. I find the Beligan yeast just takes over, and that American hops can easily clash with dark malts, if not balanced beautifully. This beer is heading back into the cupboard for a couple of months. I'll pull it out and write an update blog when I next taste it.